Do you want to know how to boost your search rankings using SEO analytics reporting? It’s not enough to measure your website’s current SEO (search engine optimization) success. What you really need to do is use SEO reports to drive more traffic to your website and continue to grow your business. In this article, we’ll show you which Google Analytics SEO reports are the most important when it comes to improving your website’s search rankings. It may seem obvious, but most people don’t monitor the amount of time site visitors spend on specific web pages of their site. Sure, you might check your site’s bounce rate, which is great for learning how many people click on your website and immediately leave. 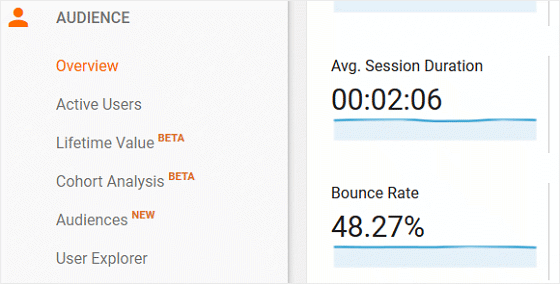 You might even navigate to Audience » Overview in Google Analytics and check out the average session duration of site visitors that click on your website. For example, site visitors that view a second web page and leave right away will not register as a bounce, even if they leave within seconds of entering your site. That’s why viewing the time spent on individual web pages is so important for understanding the behavior of your site visitors. After all, even if you have a ton of organic traffic coming to your website, if everyone is leaving after viewing a page or two, you have some SEO work to do. That’s because if the time spent on your website is low, no matter how many pages they visit, you’re not targeting the right audience. To find the report containing the time spent on each web page, navigate to Behavior » Overview. Here you’ll find the average time spent on your site’s pages. Scroll to the bottom right-hand corner and see the small link labeled view full report. You’ll now see a complete breakdown of the amount of time spent on each individual page. But there’s a problem. 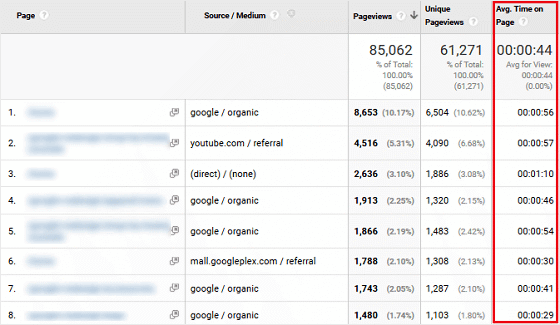 This shows you the average time spent on each page from all traffic sources, not just organic sources. And it’s the organic sources that matter when it comes to SEO. To find out how long site visitors from organic search results are spending on each web page, navigate to Secondary Dimension » Acquisition » Source/Medium. Now you’ll see the source and medium of all pages. The Source/Medium to focus on is google/organic. Remember, we’re working on improving our SEO efforts. The longer people from Google search results spend on your pages, the better your SEO efforts are working, because you’re targeting the right people who’re looking for what you have to offer. Record the average time spent on your website’s most important pages, A/B test elements on them to boost engagement, and track the time spent on those pages over time to see if it increases. Remember, the longer people stay on your website, the more favorable search engine rankings you’ll receive. You can also improve your content’s keywords so your site ends up in the right search results in front of the right audience. You should know by now that having a mobile-friendly website impacts your site’s SEO. And, if you’re using the MonsterInsights plugin, chances are you’re checking out your Overview Report to see the device breakdown of your site visitors. You might’ve even started using the Google AMP addon to make sure you receive accurate mobile analytics. But there is more to knowing that mobile users are consistently visiting your website. You need to know whether your SEO efforts are working and making site visitors from mobile devices stick around once they land on your site. After all, if a site visitor on a small device can’t see or navigate your website, they’ll leave. This affects your future SEO rankings and your bottom line because the time spent on your pages is too low and your visitors aren’t converting into customers. To find out how engaged mobile users are on your site, navigate to Audience » Mobile » Overview. Here you’ll see the breakdown of devices – desktop, mobile, and tablet – and the bounce rate, pages/sessions, and average session duration for each device. Though mobile devices tend to have lower stats than desktop, there shouldn’t be a huge difference. If there is, you should focus on making your website more mobile-friendly. Mobile SEO is improved by focusing on the user experience, site speed, and performance. By building on these three elements you can increase your site’s mobile SEO and see a spike in mobile and tablet traffic. Knowing which site terms your website’s visitors are searching for once they land on your website is valuable information to have if you are looking to improve your site’s SEO and build your business. If you know what site visitors are looking for, then you can give them what they need, increase organic reach, boost your site’s SEO, draw more traffic to your site, and bingo, convert more site visitors into customers. The first thing you’ll need to do to see what site visitors are looking for on your site is let Google Analytics know you want to track that data. For help doing this, check out our step by step instructions on how to set up site search tracking in WordPress. Next, navigate to Behavior » Site Search » Overview. Here you’ll see the search terms people are expecting to find on your website once they arrive. If there are search terms you don’t have content for yet, now is the time to start adding that to your editorial calendar. You can also use the search terms people are using on your internal site search and see how they match up to the keywords in your existing content. If you see some differences, you’ll know you need to focus more on keyword research to target more of what the average person is looking for. By doing this, your content will show in more search results, and for the people that are interested in what you have to offer. And there you have it! 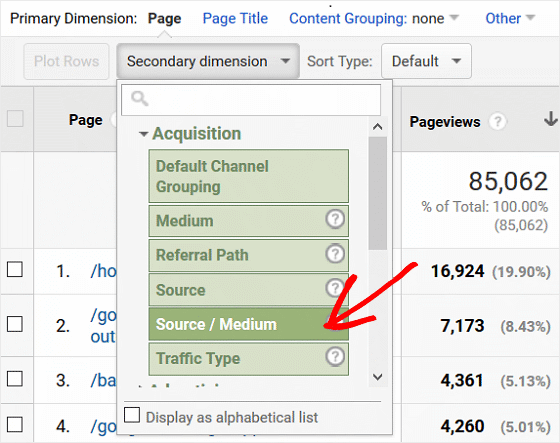 Three unique SEO analytics reports found in Google Analytics that you can use to ensure your site’s content is showing up in search results for the right people so your business can grow. If you want to learn more about how to utilize the power of SEO in Google Analytics, check our guide to Google Analytics SEO hacks for increasing organic traffic.